You decide that you wanted an acoustic guitar and play it as good as a free style artist on the street. So you run to the nearest music store you know. Talk to the salesperson and ask for the cheapest acoustic guitar they have, and so they give you what you wish. A lot of us has made this mistake in the past. Opting to save a few bucks instead of buying a quality acoustic guitar. Luckily, we have compiled these following tips on how to choose the best acoustic guitars for beginners like you! Knowing which guitar brings you the joy and benefits of a music instrument is important! Don't just follow your common sense and pick the cheapest there is in the shop. Gather yourself some helpful tips to get the best guitar that suits your playstyle." We often hear the phrase “You get what you pay for”. This can’t get any truer with acoustic guitars. Buy a $50 guitar and you might end up with one that would be better used as a wall hanging. Thus, you need to think how much money you can pay, and what the quality you can get with that money. for example Jasmin guitars tend to be really affordable, much more than the other brands, but it still offers you quality sound and ease of use. You just need to invest more on the strings. Unknown by many people, acoustic guitars can actually be categorized on the type of sounds they produce. Each guitar classification then works best for very specific uses, and have very different sounds. Are you into strumming sounds? Get a Dreadnought. Are you into picking and single note sounds? Get a Triple O. An Acoustic guitar’s sound board is the oval-like shape pieces of wood that covers the top of the guitar. It is what helps the guitar produce its signature vibrating and full sound. The type of wood used on the sound board shapes the guitar’s tone and volume. For example, Sitka spruce produces a round and well balanced sound, while an Adirondack spruce produces a louder and crisper sound. There are two common types of guitar strings, one is nylon and the other is metal. Nylon strings are for classical and folk music, whereas steel strings are for modern rock, and country style music. Choosing one type of string at the moment you buy a guitar is crucial because guitars are not interchangeable between these two. You can take a look through our articles and reviews on different brands of acoustic guitars here, to have a closer look of what features a good acoustic guitars possesses. Just use what you've learnt here. Determine your play style and a guitar that suits it. ​Pay attention to the material of the sound board. 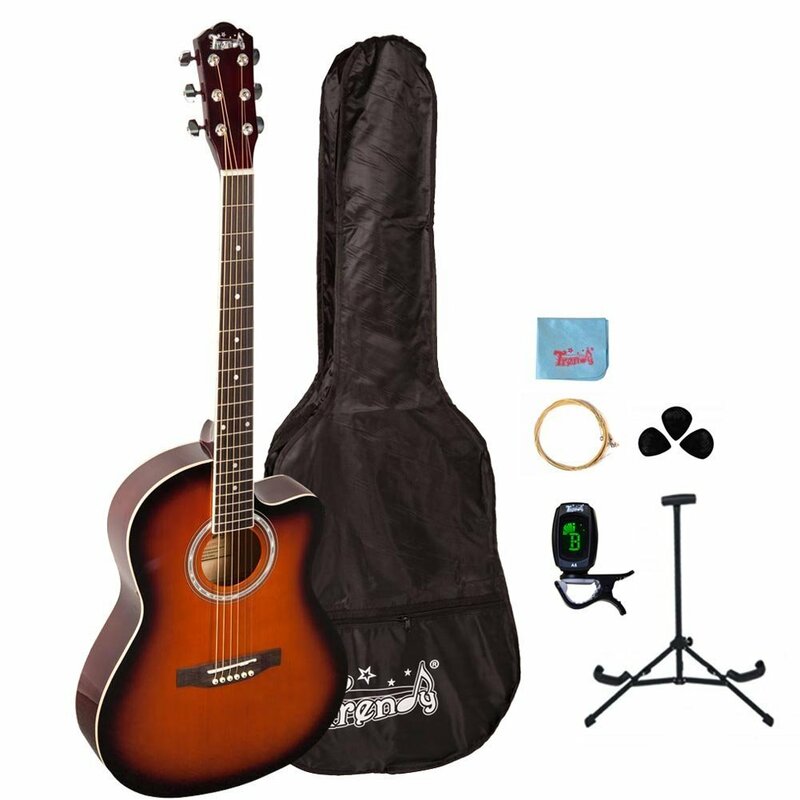 Buying your first acoustic guitar is a very exhilarating experience for any music enthusiast. It is your first step to the world of music and art. Like every first step, we need to make sure that we don’t mess it up in any way. That is why we need to know certain things before we go and choose your first guitar. Remember: just take your time! !